It seems that both the witches and the goblins have it in for Elle and Niall -- she has plenty of conflict with both factions, yet finds herself using her powers to try to make peace between them. When Elle is summoned by her nemesis, Rebecca, to investigate an accident at an archaeological dig, she finds ties to the Edinburgh coven, but there is also evidence of goblin involvement. Even more perplexing is new information about her mother's mysterious death. Determined to get to the truth, Elle meets with the goblins. Suspicion is thrown on Niall, but Niall throws suspicion right back on the goblins. The coven witches have plenty to say, too, and their conflict turns territorial. Who can Elle believe: the warlock she loves, the witches or the goblins? 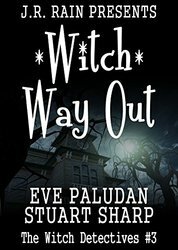 When her pregnant goblin friend faces life-threatening danger, will what Elle uncovers escalate into an all-out witches-versus-goblins battle? And will she be caught in the middle?